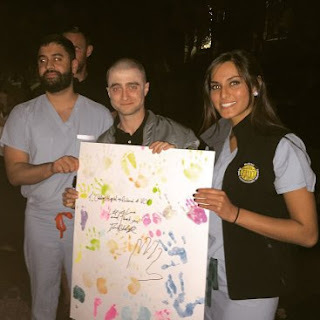 Thanks to a tweet from the Children's Hospital of Richmond at VCU (Virginia Commonwealth University) which mentions danieljradcliffe.tk I can share the following great photo and video. Two M3 students did meet Daniel while he was filming Imperium in Richmond. Daniel signed a poster made by some of the patients at VCU and etched his own handprint on it as well.